Body and frame: die-cast aluminium unpainted, EN AC-47100 (equivalent to LM2). Glass: 4mm thermally toughened, meeting requirements of AS/NZS 60598-2-5. Wiring / ignitor box: polyamide (66 V0 Black: 20% glass fibre re-inforced). Stirrup fixed by a single bolt through Ø 22mm hole or 105x17mm oblong hole, or by twin bolts through Ø 15mm hole. Ignitor box delivered with floodlight, cable gland for 8-12mm cable. Safe rear door opening with automatic disconnection. Tool-free lamp installation and replacement. Optional memory setting accessory available to lock aiming position. Optional visor fixed via 4 screws. Aiming via integrated aiming sights on both sides of the floodlight, precision aiming device also available and adjustable around frame. 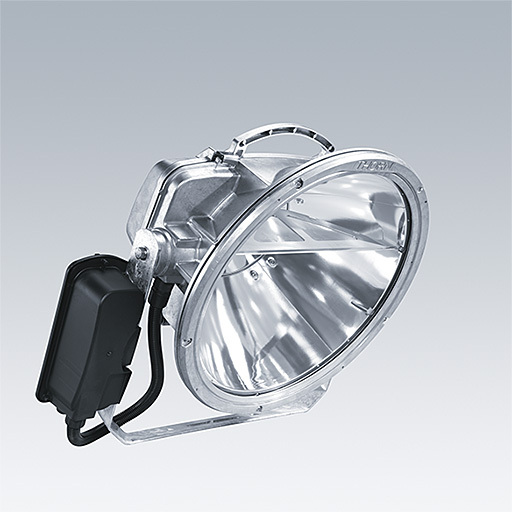 High performance floodlight with Altis® optic reflector for 1 and 2kW metal halide double ended lamps. Tool-free door opening and lamp installation, rear access to ignitor box, memory setting accessory. IP66 (IP65 for HR versions), IK08 (IK09 body and glass), electrical class 1.